Despite all the knowledge I’ve gained from the past 10 years working at one of the best plastic surgeon’s offices in Nashville, I find that I’m still a minimalist when it comes to skin care. I have learned that making small changes when you’re younger can save you big time in the future. I don’t use Tretinoin, a product that is often referred to as one of the most effective skin care products a person can (and should) use. Our aesthetician, Griffin Churchwell, occasionally asks me why I don’t use it, and I usually mumble some sort of excuse and walk away without making eye contact. I don’t use a good eye cream, even though I’m already bothered by the fine lines that are forming under my eyes. I don’t even regularly wear a good daily SPF, and I know how important a good sunscreen can be when it comes to preventing, not only skin cancer, but also the sun damage that ages us so much. The sad truth is that I’m part of a generation that loves a quick fix with instantaneous results, and a good skin care regimen requires time and patience. Deciding that 2017 is going to be the year I take charge of my skin care routine, my first step was to schedule a formal skin care consultation with Griffin. I have a combination of oily and sensitive skin, leaving me with larger pores and occasional redness. She recommended a Profractional laser treatment to resurface my skin, which would help minimize the size of my pores, as well tighten my skin. The Profractional laser treatment triggers the skin’s natural healing process by sending laser pulses beneath the skin’s surface, stimulating collagen production. It does come with a few days of downtime, where it’s recommended you stay out of the sun and other harsh elements. After-care products are provided with the treatment, as the steps you take the first few days after are critical in the healing process. I arrived to my appointment make-up free. Griffin cleaned my skin with alcohol wipes before applying a numbing cream to my face, which was left on for about 30 minutes before the treatment was started. Because it is a laser, she placed goggles over my eyes to keep them protected, and began the session. I was a little anxious about what kind of pain to expect, and while there were a few spots around my lip and forehead that did cause me to internally grimace, for the most part it was fairly tolerable. I was given a cooling wand to blow cold air on to my face during treatment as I felt necessary, which helped. Knowing that the fine lines around my eye area were a particular bother to me, she did use a higher setting on my under eyes. All in all, the session was approximately 10 minutes long. 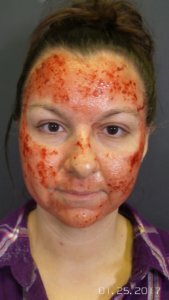 She applied some of the after-care products to my face before I left, and warned me that I would see blood on my face as the day progressed. She instructed me to gently cleanse my face with cool water, re-apply the after-care products 4-5 hours after my session, and again before bedtime. She also recommended I try to sleep with my head elevated that night, to help keep the swelling down. Griffin did her best to prepare me for what to expect the morning after the treatment, though admittedly, it was still a bit shocking. When I first looked in the mirror, my face was covered in dried blood and swollen. She instructed me to use a cool water and a soft rag to gently remove the crusted blood from my face. Afterwards, my face was red, as if I had a bad sunburn, but looking much better. I applied my after-care products to keep my skin protected, and repeated the steps every 4-5 hours. It’s been one week since my Profractional laser treatment, and my skin looks as if it has completely healed. My pores are noticeably smaller, and skin feels so smooth! My face is still slightly pink, but it is easily concealed with make-up. Because my skin is still healing, I have been diligent about wearing a good SPF. Overall, I’m already so happy that I did this! Griffin mentioned that I will continue to see improvement in my texture and pore size over the next several months. She is going to start me on a Tretinoin regimen when I’m two weeks post-treatment, which will continue to stimulate cell turnover and collagen production. It’s been a month since my treatment, and I honestly can’t believe how different my skin feels! When we took my one-month-after photos, the differences were subtle. My pores are smaller, and the fine lines around my eye area aren’t as pronounced, but the biggest difference I have noticed is how smooth my skin feels. Having oily skin can lead to larger pores, giving your skin a bit of texture, and it was one of my biggest complaints before having my laser treatment done. Now my skin feels smooth all over! Since doing my Profractional laser treatment, I have since upgraded my normal skin care routine. I want to make sure to I keep my skin in the condition it’s in now, and not erase all of the progress accomplished by the laser treatment. It takes a little longer each morning and night, but the extra five minutes each day seems to really be paying off!